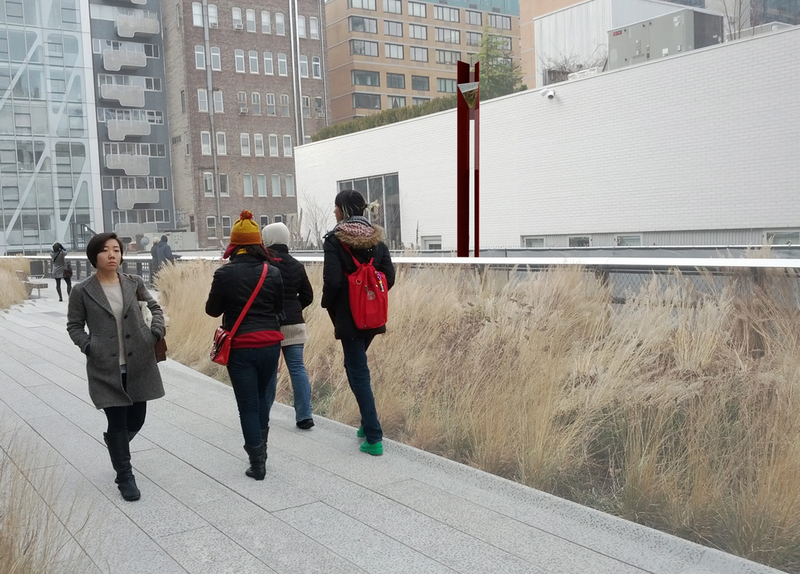 The underLINE is a “device” that inspires and directs the behavior and actions of the visitor, offering a new way to interact with New York's High Line, connecting the upper and lower corridors of the linear park. As for any urban scale infrastructure, the proposal recognizes that some of the most unforgettable and informative images of the Highline are the aerial ones, which are obviously restricted to the inhabitants of the adjacent high rises. Allowing the existing structure of the high line to serve as a buffer, we interpret the ground level as a display surface for projecting the High Line activity above.The design specifically declares that a new roof is not needed, (the entire allotted space is already covered by the Highline whose underside needs to be celebrated in all its industrial beauty), but rather a new flooring surface, with only the introduction of elements that are fundamental to the experience proposed. The key elements are the essential periscopes, informal seating, a new flooring surface that gently rolls like a meadow, morphing into semi-reflective metal walls that both define the space and provide for the public projection of the live footage streaming from the cameras. It accommodates both concealed, intimate viewing as well as the social, turning the unused Highline underbelly into a functional civic space; not dissimilarly to a well tailored jacket, you can learn more about its construction by looking at the inside under the lining rather than the exterior. The two periscopes that anchor the installation change the habitual viewing perspective of the High Line. They collect live feed, both at walking and at bird's eye level, along different points. In a surprising reversal of the viewing vectors, the fresh perspective is curiously the one from the most exclusive area residential units. These projections allow the underLine visitors to progress through the pavilion as they would the High Line, whose 20 blocks length is condensed within the length of the site. The underLINE affords both public and private interaction, as the user is able to control the periscopes‘ positions from left to right, thus informing the data being transmitted to the crowd. The public experience is therefore a collective viewing of the live feeds, changing the nature and the mood of the pavilion as the High Line traffic changes, as well as with weather changes and the time of the day. The periscope operator puts, in essence, its own show up. This provocation of traveling beneath the High Line to understand its birdseye views will entice the public to visit the underLine, and the way in which it transforms with the weather and time of the day, will keep the visitors coming back. Like the High Line design interprets its inheritance, so the underLINE pavilion re-interprets both the voyeuristic and exhibitionistic characteristic of the Highline, where the visitors are showing off for, as well as, spying on the inhabitants of the buildings flanking the park.